Here are the years/mfrs. Not sure about a list for numbers per year. Thanks for reposting the list , Chucker! It just seems that I see (here) a lot of 52's, 58's, 45's etc. but hardly ever see a '64, '68,'69,'53 and a few others. Never seen a '57, that I remember. It just seems that I see (here) a lot of 52's, 58's, 45's etc. but hardly ever see a '64, '69,'53 and a few others. I have a 69 , 58 , 45 , 86 SMP , and converted 42 BX with 44 Burner. But your '69 is about the only one that I see mentioned here. We have a 58 Coleman that is a strong, easy to lite runner and a 87 SMP that we have yet to work on. I'd like to get a Milspec from 1967, 68 or 1969 as I also collect LRP/LRRP/Ranger items from the Vietnam era. 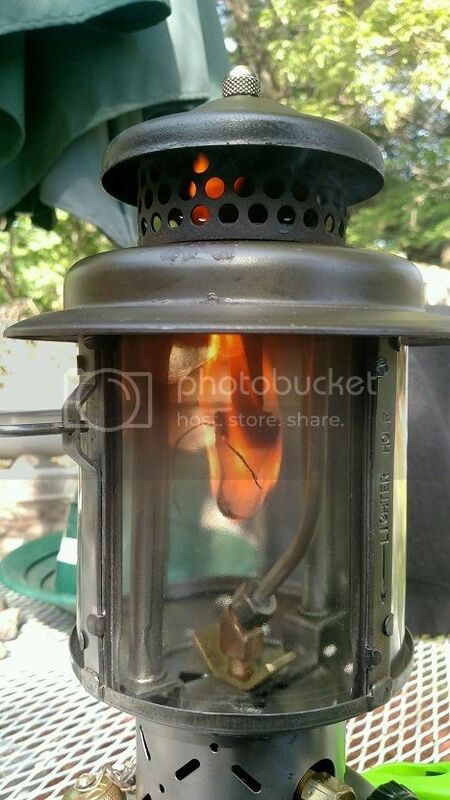 It's next on my target list of lanterns to own. Thanks for the info. Curly, what are your thoughts on this question. I know you specialize, to some degree, in the MilSpecs. I wonder why Roger Hill doesn't ever frequent the forums here? A couple years ago (approx.) during some communication with him, I mentioned the forums here and he acted like he was not familiar with this place, thought that was odd, but oh well? Here is list of dates reported in this thread so far. I welcome any and all info/ dates, will not include manufacture since the above list covers. 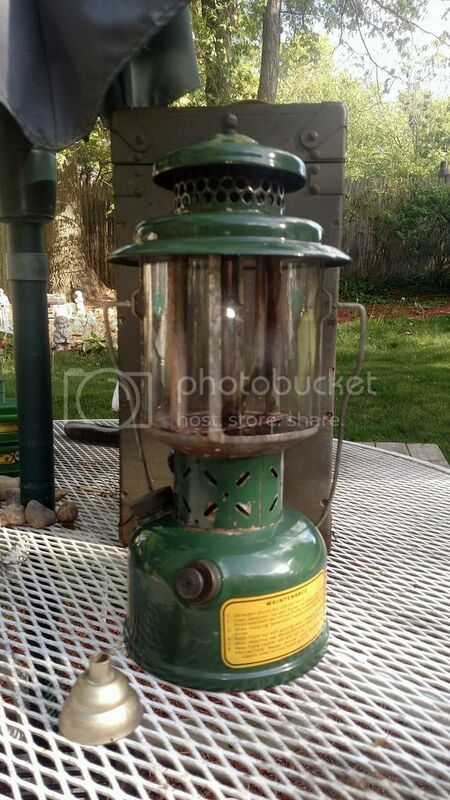 1962 and 1970 marked lanterns have never been seen by collectors as far as is known. Second Column = year of manufacturer as marked on base plate. Once, at a very large flea market, I picked up two milspecs from two different dealers. Both were 1969 and neither had quad globes. They both had the "U.S." marked globes from '44 to '52. It's true, it seems like certain years of milspecs are more concentrated in different parts of the country. I'm sure this topic has probably been explored in the past, but I don't remember seeing anything on here in my memory(no surprise, concerning my memory). I've a 52 and a 73. I had a 44 but the fount died. I have 2-'67's , '63, '80, and a '77 and a '45 to add. Also a 7 - 42 late B conversion, I will record the earlier dated converts in this category after more data. (edit) forgot about a '51 that I have that is in like fired once condition. OCETECH- I made the mistake of not liking these from the get-go, probably mainly from reading neg, reviews on here. So I used to not pick them up and have passed over many through the years, I regret having done that now...AW, Live and Learn. I suspect someone may come along and have most if not all yrs. in their collection. true that I have a lot of them. the actual war years tend to be the rarest. so from 46-51 for Korea and the Vietnam 64-69, then 90-91. I have only seen a pic of one 69 and now the ones mentioned here. The Korean War was June 1950 to July 27, 1953 and Vietnam was 1964 to 1975, actual large scale ops started around 1964. The war didn't end in 1969 there was still plenty of action after that point. The Vietnam Veterans of America membership is open to people who were involved in other than training purposes starting in 1961. 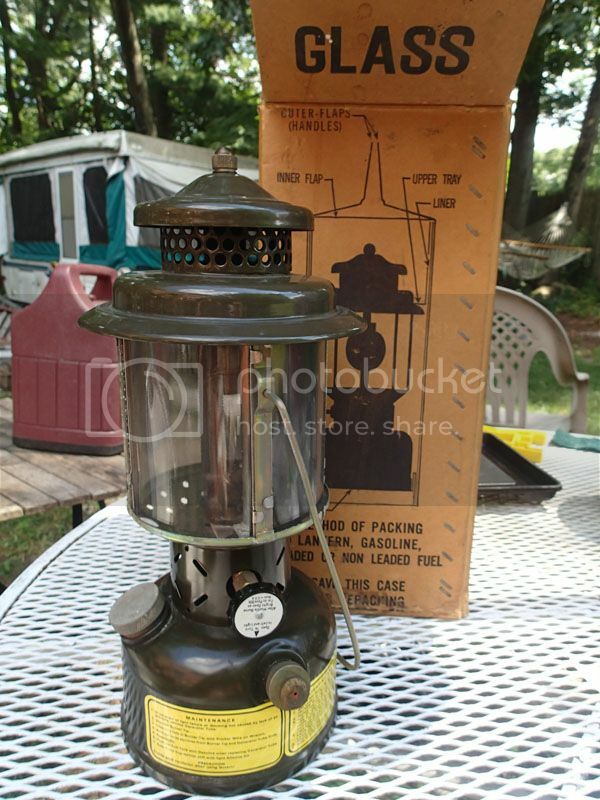 So any milspec until April 1975 would be a "war" lantern to me. I have a 1984 and a 1979 to add to the list also. Now you're really going to make me cry. I have never seen a Mil-Spec in the wild here in Utah and we have one of the largest Mil-Surplus bases there is here. Got my '69, once fired, with original box on the local Boston Craigslist last year. There are 2 1969's on Ebay right now, one for $125 buy it now, but it is a bit rough, the other for $150 buy it now in really nice NOS shape. There are a fair amount of money vs finding one in the wild. I am still searching the bushes for more. 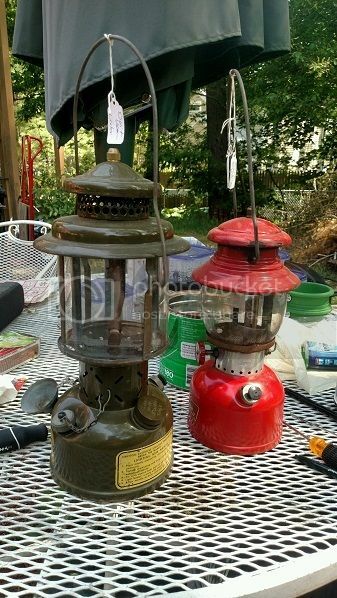 I have a 1944 coleman unfired, a 1961 coleman, 1967 auto-fab and a 1972 F. T.
Perhaps I was a bit vague when I put the dates in. I showed what i had seen as gaps in the years that they seem to be available now. 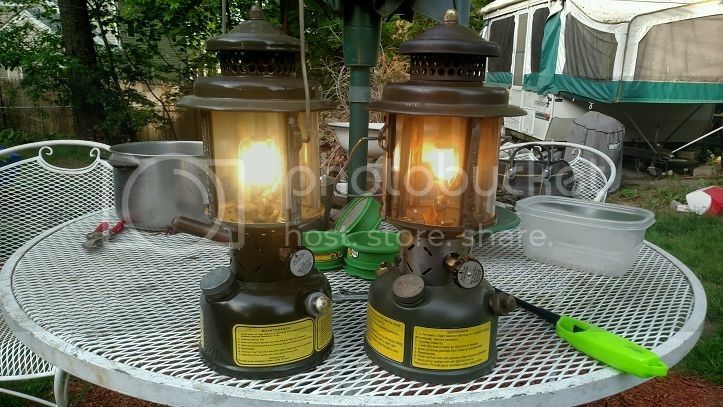 From what my contract specialist on post told me about it when asked, Equipment such as lanterns that are sent to a war zone typically come from pre existing stock at the onset and then would be re ordered or have a larger numbered ordered as the stocks ran low during or immediately after. So lanterns sent in 1950 would have been made before. The same for the Vietnam years. Then there was the less predictable war stock warehouses in the state NG or RESERVE replenishment or the all together end of life cycle for the Milspecs in the mid 90's. The Army post I work at Drmo auctioned pallets 4x4 x 3ft deep full of turn in lanterns. Not a problem and your explanation makes sense. I will bet those 4x4 pallets when for dirt cheap money! Ugh I am using a phone and can't edit it worth a hoot. I wanted to add a thanks for including the dates of the conflicts. Here are the dates that I have. Can someone add them? Thanks everyone, the list is filling out nicely but some gaps are starting to appear and I doubt the all get filled...not counting the two years that we already knew that hadn't been seen. @Curly- Thanks for the "insider" info! I've got the same,a '65 Coleman, that I'm going to give to our club to auction off at the MVPA convention this month. The period between '45 and '55 is looking pretty sparse , I'm quite sure I've seen a few that fall in that period, but not many. In an older post, I remember seeing that Roger Hill had a nice display at one of the conventions a few years back. Anyone on here that went and remembers, did his display have an all inclusive run through the years? Jan, in some of the older posts you posted a bunch of pics showing that display. Do you remember any of what was included? Thanks if you have any comments on his display, anyone else? Might have been the Convention at Yucca Valley? Thanks again for anyone who provided or provides info in the future ! I just won a milspec on Ebay, my first non-Coleman, an SMP:. The fount looks like it is missing most of the paint and I probably over paid at $39 but the picture shows it working, so that is one thing. It is a 1981, my first later than my '69 I guess I was inspired rightly or wrongly by this thread. 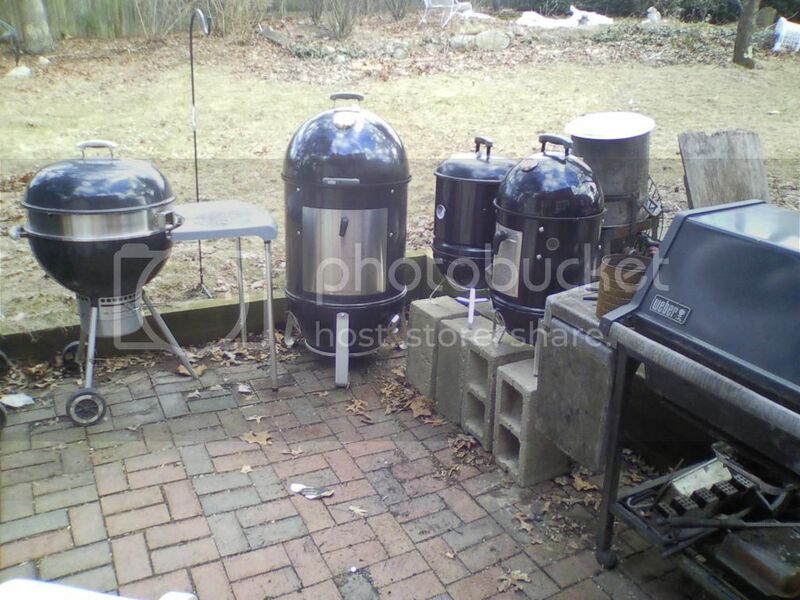 Oh well, it is not more expensive than taking the wife out to dinner, so we will have smoked chicken this weekend! Good catch Curly, it appears that I mis-read my own scribbles while transcribing from my paper notes, I must have mistaken a poorly marked 5, from 45, as an eight, hence 48. Thanks for pointing that out! I wish others would chime in with their MilSpec. Years.